Use a scatter chart to show correlations and relationships within your data. 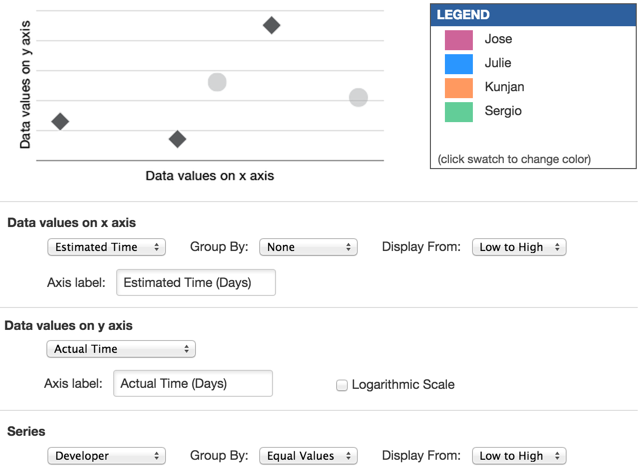 Scatter charts make it easy to visualize how one data set (the x axis) affects the resulting data set (the y axis). For example, you could use a scatter chart to show how project cost affects return on investment (ROI). You can also use a scatter chart to see trends and outliers at a glance. For example, you might use a scatter chart to visualize how your team's actual ticket resolution times compare to their estimated resolution times. Like all Quick Base charts, scatter charts are interactive; click a point on the chart to view the record(s) associated with it. You can also apply dynamic filters to scatter charts. Open the table in the table bar, click REPORTS & CHARTS and then click + New. Select Chart and click Create. In the Basics section, Name your chart and give it a Description. Tip: Select Show description on chart page so others can easily understand the purpose of your chart. Select Scatter as the chart Type. Data values on x axis: select the field whose values you want to display on the x axis. Select to group values in intervals or set amounts in the Group by list, or select None if you don't want to group values. Selecting None means all data points will display at their actual values, not as summed or averaged values. Data values on y axis: select the field whose values you want to display on the y axis. You can use the plus ( ) and minus ( ) icons to add and remove values from the y axis. If you choose a Group by option (other than None), select to display data points at summed or averaged values. If you want to define a calculated column to display in the chart, select Calculated column, and then define the calculated formula in the Options section. Tip: Remember to label the x and y axes; this helps others understand your chart. Series: select a column if you'd like to display y-axis values in a series. A series lets you plot different y axis points for separate categories. Select how to group and display the series of values. You can display either multiple y axis fields or a series. Sorting: decide how to sort your scatter chart. Data labels: check if you want to display data labels. You can choose to display the value or the value as the percent of the series. If you selected to measure a Calculated column, select define a calculated column, label it, define the formula, and select the type. Save the chart as Personal (only you can view it) or Common (others can view it). Optionally, you can also assign the report to a group. This scatter chart shows how each developer's actual ticket resolution time compares to estimated resolution time. Estimated Time displays on the x axis. It is not grouped, so a point displays on the chart for each time estimate. Actual Time displays on the y axis. A series is defined based on the Developer field. 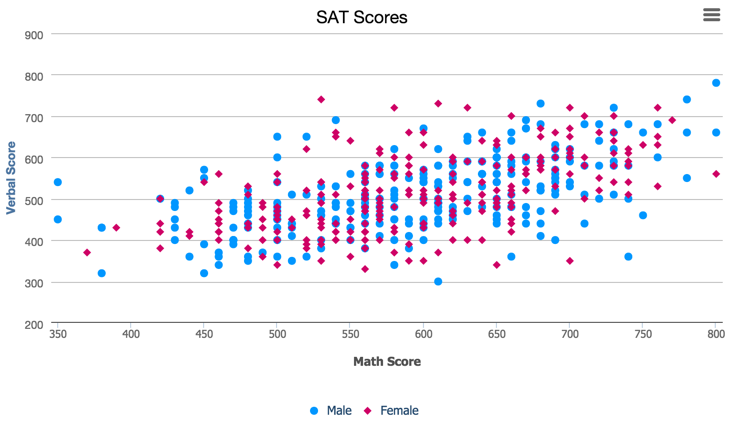 This scatter chart shows math and verbal test scores colored by gender. 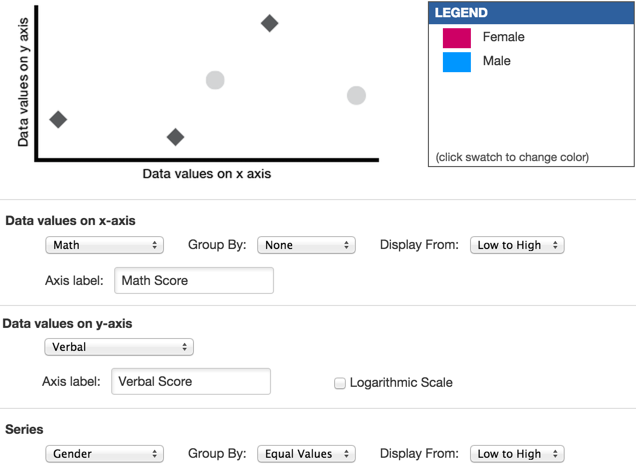 Math Score displays on the x axis. They are not grouped, so a point displays on the chart for each actual score, displayed from low to high. Verbal Score displays on the y axis. A series is defined based on Gender.